Balance and Composure release their new album Light We Made through Big Scary Monsters in the UK physically on November 4th and digitally in line with US on October 7th. A follow up to the hugely acclaimed US Billboard Independent album chart top 10 last album The Things We Think We’re Missing from 2013, the band took some time off between albums and touring following drummer Bailey Van Ellis’s car accident, to regroup and refocus the band. 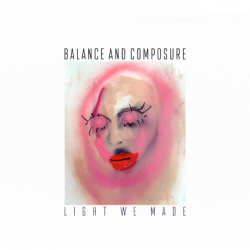 From the outset it’s obvious that Balance and Composure have upped the game on Light We Made. This time around the song writing and structure is grander and more ambitious. The sound is deeper, more experimental with less emphasis on riffs and more on creating an atmospheric landscape. In part it feels like the band moving away from their emo / rock roots towards a more all-encompassing alt rock sound. It’s not as immediate, but my word, it’s a step up. There’s the same emotion at the heart of the lyrics but it’s the music formed in the swirl of melodic riffs, atmospheric bass grooves and dreamy synth chords that really make you sit up and take notice. Both lead single ‘Postcard’ and ‘For A Walk’ are perfect markers of the new sound. The synths beats complement the emotion and gradual approach, rather than going for the jugular the songs develop over several listens engraining themselves right down to your core. Opener ‘Midnight Zone’ shows the ambition of Light We Made with its multiple textures while ‘Frame’ hints at the Balance and Composure of old with atmospheric emo tones. ‘Call It Losing Touch’ stands out with its mellow chorus playing the perfect antithesis to the high energy verses while album closer ‘Loam’ goes for a dark and pulsing finish. Light We Made overall feels like a natural progression for the band. Thrilling.